Fifty-six years ago this month, the USAF/Republic YF-105A Thunderchief took to the air for the first time from Edwards Air Force Base. With Republic test pilot Russell M. Roth at the controls, the fabled Thud exceeded the speed of sound during its maiden flight. The USAF/Republic F-105 Thunderchief was a member of the fabled Century Series of jet-powered production aircraft. It was designed specifically as a fighter-bomber capable of delivering nuclear ordnance. Famed Republic aircraft designer Alexander Kartveli is credited with creation of the F-105 airframe. The Thunderchief was a big airplane. The original version (YF-105A) measured 61.5 feet in length and featured a wing span of 35 feet. Gross take-off and empty weights were 40,561 lbs and 28,966 lbs, respectively. Power was provided by a single Pratt and Whitney J57-P-25 turbojet which produced 15,000 lbs in afterburner thrust at sea level. 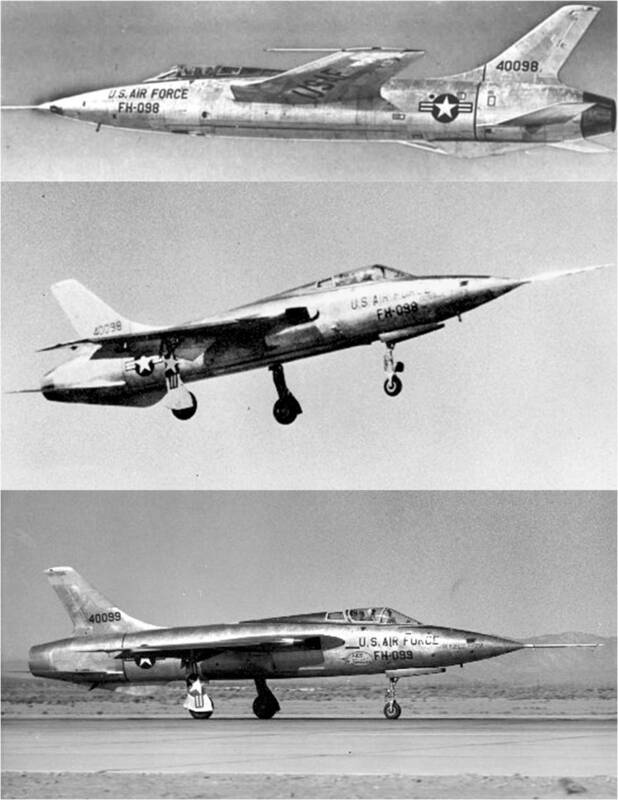 The YF-105A was designed to have a maximum speed of 778 mph at sea level and a maximum speed at 36,000 feet of 857 mph. The aircraft had a combat ceiling of 49,950 feet and could carry an ordnance load of about 8,000 lbs. With an internal fuel load of 850 gallons, the aircraft could fly 878 nm. Range was increased to 2,364 nm with the addition of 1,870 gallons carried externally. The first YF-105A Thunderchief (S/N 54-0098) made its maiden flight on Saturday, 22 October 1955. This initial test hop was conducted at Edwards Air Force Base, California, with Republic test pilot Russel M. Roth doing the piloting honors. Despite a high level of transonic drag resulting from the lack of fuselage area-ruling, the aircraft hit Mach 1.2 on its first time in the air. The Thunderchief entered the USAF inventory in May of 1958 as the F-105B. A number of variants followed in the years that followed. The F-105D was the definitive single-seater version. The F-105F served as a combat-capable trainer. The F-105G was also a two-seater and flew the Wild Weasel mission. Performance of the later versions of the Thunderchief significantly exceeded that of the YF-105A. For example, the F-105D Thunderchief was powered by a Pratt and Whitney J75-P-19W turbojet that produced 24,500 lbs of thrust in afterburner. The engine was fed by side-mounted, variable-geometry, forward-swept air intakes that were more efficient than the original design. Further, the fuselage employed area-ruling to reduce transonic wave drag. Taken together, these changes gave the Thunderchief a Mach 2+ capability. The F-105D had a gross take-off weight of 52,546 lbs carrying a 14,000 lb conventional ordnance load-out. Empty weight was 27,500 lbs. The aircraft’s small wing area (385 square feet) resulted in a very high wing loading. While this permitted very stable flight during the high-speed, low-altitude run-in to the target, the Thunderchief was no match for the agile MIG-17 flown by the North Viet Nam Air Force. Notwithstanding, the Thunderchief had 27.5 air victories against the North Vietnamese compared to 17 losses to the enemy. Republic Aircraft manufactured a total of 833 copies of the Thunderchief by the time production ended in 1964. Viet Nam was the Thunderchief’s war. Over 20,000 sorties were flown by Thunderchief aircrews. Many of these missions were flown into the Pack VI region of the air war over North Viet Nam. A total of 382 Thunderchief aircraft were lost during the air war. This inordinately-high loss rate was largely due to the shackling and politically-motivated rules of engagement enforced by the Johnson Administration. The F-105 no longer graces the skies. However, one can see the aircraft on display at a number of air museums throughout the country. The National Museum of the United States Air Force at Wright-Patterson Air Force Base in Dayton, OH is one such example. In its time, the Thunderchief was a mighty performer and particularly loved by its pilots. Many books have been written by those who flew “The Thud” into hostile skies. These personal accounts are quite inspiring and often poignant. To get a sense of what it was like to fly and fight in the Thunderchief, Jack Broughton’s “Thud Ridge” is an unforgettable read. That was a great report on the F-105. Russel Morgan Roth is my grandfather. Thank you for speaking of him in this report.